Bathrooms are never the biggest rooms in the house, and sometimes they can feel a bit cramped. With lots of different things to fit into a bathroom, including a bath, toilet, sink, towel rail, and more, it’s no wonder we find ourselves with limited space. Using a range of contrasting colours in your bathroom décor can make it look smaller. Keep the walls and floors the same colour, preferably white, and only introduce new colours when it comes to adding accessories. 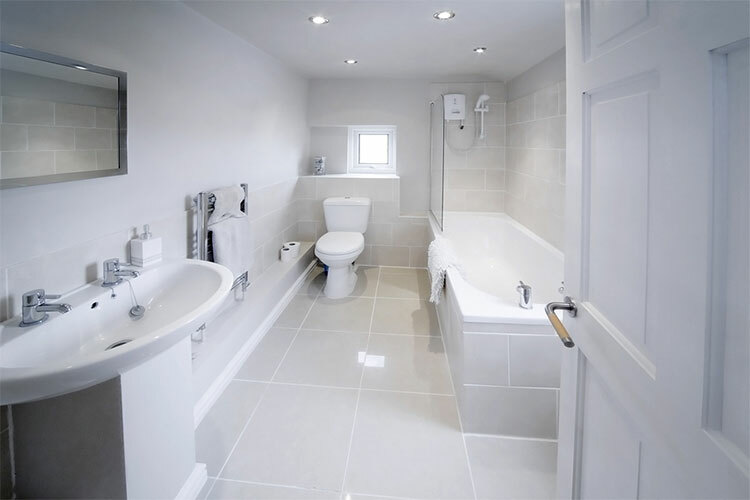 Using white paint and tiles will reflect light, opening up the room and making it feel much more airy and spacious. Use a light fixture or cabinet to add a splash of colour and keep the ceiling a shade lighter than the walls. Lighting can also really help to brighten up a room without taking up any room. You can install a skylight in your bathroom if your budget allows, or simply place skylights across the ceiling. If there are any low-light areas in your bathroom, add a lamp or a light fixture, as this will trick your brain and eyes into thinking there is more space than there actually is. A great way to save space and make your bathroom look bigger is to replace any floor cabinets you have with wall cabinets – replacing bulky ground-level storage units will free up more floor space. Install floating shelves where you have space around your bathroom and utilise the back of your door as much as possible – you can get some great hanging storage units that will hold your shampoos, toiletries, and more. A favourite when it comes to creating the illusion of space is using mirrors. A well-placed mirror will reflect light into the room, making it much brighter and giving the impression it’s bigger than it is. Vertical mirrors will make a space seem taller than it is, and horizontal mirrors will create a wide effect. Place your mirror opposite the bathroom window for the best results, as this will help bounce light around the room. Transparent materials like glass are great for opening up a room. When a room is broken up by thick, dark materials, such as wooden shelves or a frosted shower door, it makes the space feel much smaller than it actually is. Install transparent shelving and glass around the shower or bath, as this will mean you can see the whole room from wall to wall without the space feeling divided up. If glass is not in your budget, then using a transparent shower curtain will also have a similar effect. In the majority of rooms, accessories look great – cushions on the sofa, trinkets on the mantelpiece, and photos round your bedroom. In the bathroom though, too many accessories can make the room feel cluttered. Try and use one or two large decorative accessories to give a sense of grandeur in your bathroom. A large floor rug and a focus piece of art on the wall will help to give the room an enlarged feeling and make the most of the space available.